The other day I mentioned, in passing, that on 8 April 1740 the English captured the Spanish ship of the line, Princesa, during the War of Austrian Succession. The illustration to the right is the capture of the Princesa. Princesa was built between 1730 and 1731, being nominally rated at 70 guns, but carrying 64. She was sailing from Buenos Aires to Spain in company with another Spanish vessel, departing in March 1740. The English got word about this and despatched three vessels to intercept them. His Majesty’s Ships Kent, Lenox and Orford under the command of Captain Colvill Mayne of the Lenox. On 8 April Mayne’s squadron was patrolling some 300 miles south-west of The Lizard when a ship was sighted to the north. The English vessels came up to the ship and found the Princesa under the command of Don Parlo Augustino de Gera. A naval chase began. At the start of the chase the Princesa was flying Frecnh colours but these were pulled down and the Spanish colours run up. This was a normal practive in most navies during the 17th, 18th and early parts of then 19th century, wearing false coloues to confuse the enemy or to enable them the sneak up on vessels. Before engaging an opponent, the ships true colours would be run up. This practice even occurred in the 20th century with the German commerce raiders in particular. 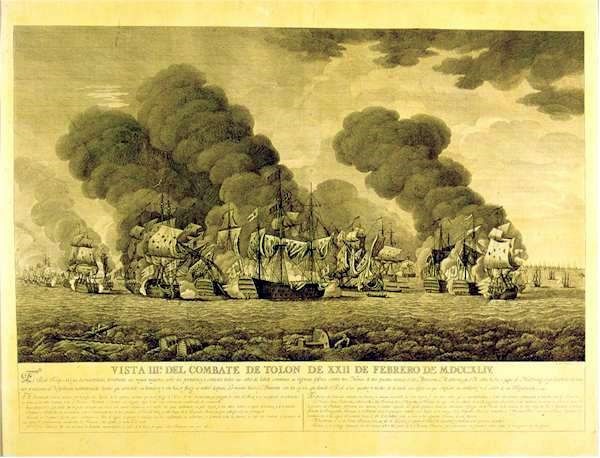 After chasing for two and half hours, the English ships were able to open fire on the Spanis, exchanging broadsides. The Spanish vessel was disabled then raked until she struck her colours. The English had captured a ship. The Princesa was taken into the Royal Navy and renamed (quite an original thought here), HMS Princess. The Princesa’s spirited resistance to the three English ships caused a great deal of comment at the time, especially as the English ships were of equal rating. She was larger than the equivalent English ships and carried larger guns. Princess was commissioned under her first commander, Captain Perry Mayne, in July 1741. She was later under the command of Captain Robert Pett, who took her out to the Mediterranean in December 1743. 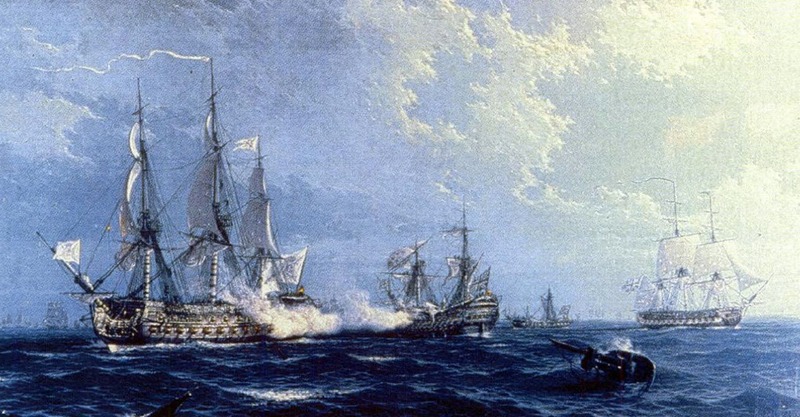 She was part of Admiral Thomas Mathews’ fleet at the Battle of Toulon on 14 February 1744. 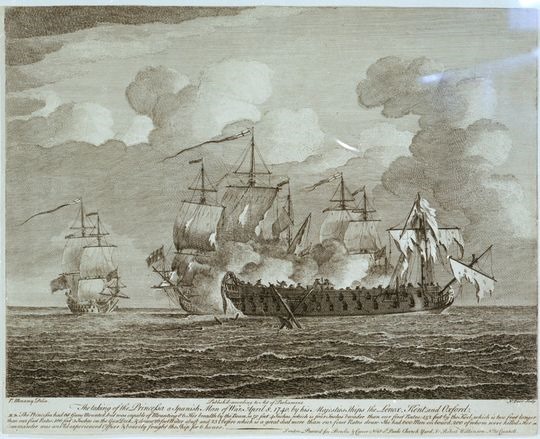 The picture to the right is of the action off Toulon in 1744 (the image, in fact all the images here, come from Wikipedia). The Princesa was a ship with a long and honourable career. She was eventually sold for breaking up on 30 December 1784.